Good news! This morning, CSF Scholar Uziel Dominguez was featured in a Wall Street Journal story about the REACH program, which helps prepare academically gifted boys starting in fifth grade to apply to New York’s highly selective Regis High School. He will begin his freshman year at Regis (which is tuition free) in a few weeks. Uziel is a feisty young man with a very bright future. He recently graduated from Our Lady Queen of Angels School in East Harlem, where his sister, Ariana, still attends as a CSF Scholar. As noted in the article, he takes his education very seriously, regularly surrendering his phone to his mother while he’s doing homework. “Once you get into the mind-set of studying, almost nothing can break you,” Uziel told the reporter. Uziel is a great example of the ripple effect CSF can have on our recipients. Just as a CSF scholarship opens the door to a quality elementary education, it also leads to more doors opening through arts and academic enrichment programs, high school scholarships, and programs that prepare students for college. Thank you to all our supporters for opening doors for Uziel and thousands of other CSF Scholars! 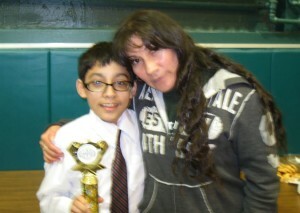 CSF Scholar Uziel Dominguez being congratulated by his mother, Isabel, after placing third in a speech contest in March, 2013. Uziel will begin his freshman year at Regis High School in a few weeks.